Nasim Na is an Iranian female vegan bodybuilder and animal rights activist living in USA. She was the first independent Iranian animal rights activist to produce and launch the first vegan TV commercial and first Persian vegan music video unveiling the truth about animal products, aimed at Persians through an Iranian satellite television (Andisheh) in 2010. From a very young age, I used to care about animals and think about meat and where it really came from. I knew that in order to make meat, an animal has to die and because of this fact, I began avoiding all kinds of meat (including fish and poultry) and animal skins and became a vegetarian. I grew up as a vegetarian and six years ago, I became one hundred percent vegan after finding out the truth about how other animal products such as milk and egg are produced. After becoming vegan I feel happier because I do not support a lifestyle that causes unnecessary suffering of innocent animals and I believe veganism is the first step the human race needs to take in order to reach a more peaceful and pleasant life. I usually do bodybuilding and exercise using weights. I exercise everyday for about one hour, spend half an hour on stretching exercises and the next half an hour on weight lifting. I sometimes make exercise and bodybuilding videos. These videos are available on my YouTube channel. The biggest misconception about vegans is that people think vegans have less energy and are weak because they only eat plants and plants have not enough protein to help build muscle! This is not true. In facts vegans who follow a healthy diet and lifestyle are stronger (this includes stronger immune system), have more energy than meat eaters. Animal protein slows down digestion and more energy is taken away from body to break down this animal protein but plant based protein is easily absorbed and turned into energy. 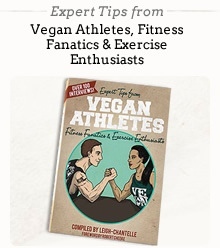 As a vegan athlete, I always feel strong and energetic and this surprises the non-vegans. My family is supportive of my vegan lifestyle and my mother and brother became vegetarian few years ago. My brother is also an athlete and bodybuilder. The most common comment people say is that we have to eat animal products if we want to have healthy and balanced diet. My response to them is that if eating animal products is so healthy then why is the number of people who die from heart disease and cancer is so high in USA? - a country that is well known as high consumer of animal products. Why do meat eaters consume supplements and vitamins if their diet is really healthy and gives them all the nutrients their bodies need? Why do they get osteoporosis as they get older when milk is claimed to be high in calcium and promote bone health?! Breakfast - Fruits and vegetables, wholewheat or chickpea flour bread, peanut butter and one cup of fortified vegan drink. Snacks - Nuts, seeds such as flax seeds (high in omega 3) and sesame seeds (high in calcium), and fruits. Calcium - Sesame seeds, green vegetables and fortified vegan drinks such as soy milk and almond milk. Iron - Legumes, green vegetables such as spinach. I get my energy from all the foods that I eat. The best way to lose weight, maintain weight and gain muscle is to exercise regularly and follow a healthy vegan diet and lifestyle. I have been active in sports since childhood and never had to worry about my body weight or gaining weight - plus exercising helps a lot in improving metabolism. I am currently active online and make videos regarding veganism. Sometimes I make and launch vegan TV commercials and shows for Persians through Persian satellite televisions.